This past week i have spent two of my trips fishing for Tarpon or the “silver king”. The morning started off at 3:30am and soon after i was on the water bait fishing. The schools of Threadfins are around the bridges right now, typically they will sit on the back sides of the wash of the current in Estero Bay, but on the Sanibel bridges these bait fish see massive amounts of pressure from guides throwing cast nets on them and they have gotten smart and now they sit directly on the front sides facing the current. This makes catching them challenging since you have to “suicide throw” your cast net directly at the pilings and let the tide pull it straight in. The trick is pulling it in at the right time and not ruining your $300.00 custom cast net! The first day was great conditions in the afternoon once the wind laid down and the tide went slack. Fish were not rolling comfortably rather they were tail slapping , typically signaling they are on the move and not settled. They presented themselves to us a few times and we pitched a Threadfin at them at the right time but they did not eat. Typical Tarpon being picky. We did manage a few nice sharks which kept my clients happy bending the rods. The second day today was a complete wash out offshore, as we were leaving the inlet to head out offshore we were greeted by 4-5 foot waves, not very fun in a flats boat. I decided to err on the side of caution and not put us all in danger. We decided to run up north to Captiva and see if we can find some rollers. With the wind howling the waves inshore were not much better and we never saw any fish roll. 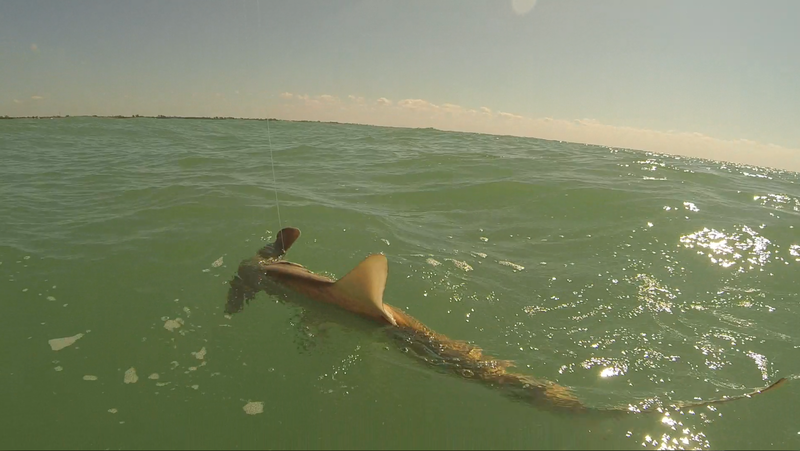 We did however have a porpoise eat our Threadfin right off the hook! For a split second it had the bait in hos mouth but they are so intelligent he never let the hook get in him. All in all i had a great time fishing with my clients and glad we were able to have a shot at catching the elusive silver king. Tarpon fishing can be frustrating and you need a little luck on your side sometimes. Theses fish will be around for a month or two so get out and get on them, or hire a guide to put you in the best spot to catch one!